The Labyrinth is an ancient path for walking meditation. It is also a powerful prayer tool that combines the spiral and circle into a purposeful path, representing the passage to our center and back again. Labyrinths are found all over the world, and are being built on the grounds of hospitals, schools, sculpture gardens, corporations and in various hospitality settings. Because labyrinth walking has been proven to increase levels of relaxation, clarity and peace, they offer visitors a way to let go of stress and find a moment of connection. We construct Labyrinths as commissioned, environmental art. They can be made in any size from a variety of materials, including fossilized bluestone, concrete, grass and crushed stone. 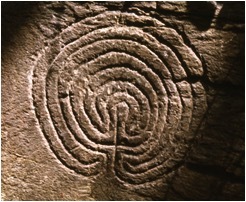 The labyrinth pictured here is built in the classic 7-circuit design that is found all over the world. 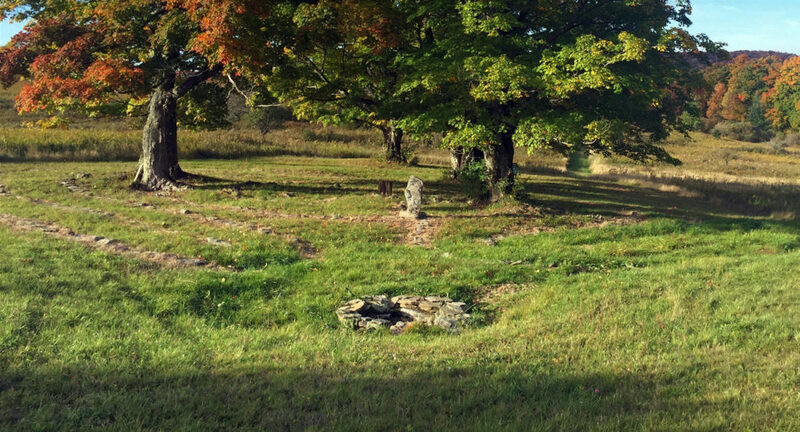 It is built in a glade which is a site that was once the home of pilgrims in the 18th century. 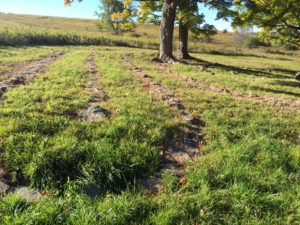 It is outlined in antique fieldstone that was picked by these settlers from their vegetable fields. We have now placed them back into nature in the shape of a labyrinth. For the center of this Labyrinth, we sculpted a Runestone made from fossilized bluestone that depicts our personal journey in ancient, Runic text. The entrance is flanked by two hand-carved Angel Wings, also made from fossilized bluestone. For more information on Labyrinths, Runestones or Angel Wings, please click here.